As yoga and meditation come of age in the West, a body of medical research into their physiological, cognitive and emotional effects is now emerging. There’s never been a better time to be a yogi, as research now suggests that specific types of yoga may help “age-proof” the brain. A recent study found that a simple twelve minute Kundalini yoga meditation, the Kirtan Kriya, increased oxygen delivery, blood flow, and electromagnetic energy in the brain. The brain is flesh and blood, just like the rest of the body, and oxygen, blood and energy all help condition the brain and keep it in optimal health. Equally impressive, the Kirtan Kriya also helped improve the function of neurotransmitters (chemical messengers of the brain that communicate with the body). The study was a joint project between the University of California San Diego, the Alzheimer’s Prevention Foundation International and the Amen Clinic of Newport Beach, California, affiliated with the University of California at Irvine. The research took place at the Amen Clinic. The study hypothesized that Kirtan Kriya would show activation of the brain’s frontal lobe and hippocampus, while providing a spiritual experience. Eleven subjects (experienced meditators) were brought in to test the hypothesis. They first sat quietly and had a baseline for control SPECT scan study of their brain. The subjects then practiced the Kirtan Kriya (Sa Ta Na Ma primal sound meditation) for 12 minutes. After completion, they each had another SPECT scan taken of their brains. Subjects’ brain physiology was measured before and after practicing the Kirtan Kriya. This project represents the first study of its kind to look at neurotransmitter function, electrical activity (energy) blood flow and oxygen delivery. In the initial brain scans, the dimples in the front of the brain show a lack of complete blood flow. The area located on the back region of the brain is lumpy and asymmetrical, also due to a lack of blood flow. In the center of the brain, no thalamus is visible. A SPECT scan of the same brain after performing teh Kirtan Kriya shows that the dimples have disappeared showing an increase in blood flow. The back of the brain appears fuller and more symmetrical. The thalamus is now visible in the center of the brain. This is especially significant for postmodern yogis and yoginis who seek mind/body balance. Why? Because the thalamus controls appetite and sleep cycles, sets the emotional tone of the mind and promotes emotional bonding with self and others. Here is how to do the Kirtan Kriya on your own: Repeat “Sa Ta Na Ma” with eyes closed while sitting with straight spine; focus mental energy on area between brows. For two minutes, chant in a speaking voice; for the following three minutes, whisper chant. For the next three, chant silently. Then reverse the order; whispering two minutes and chanting mantra aloud for two minutes. Twelve minutes to enlightenment – check it out. The Kirtan Kriya is so fun and easy that anyone from pre-schoolers to Alzheimer patients learn it in a matter of seconds. This writer has taught the meditation to children of all ages. It’s a great stress-relieving tool for people to do while stuck in their cars during traffic jams or silently while waiting on line at the bank. 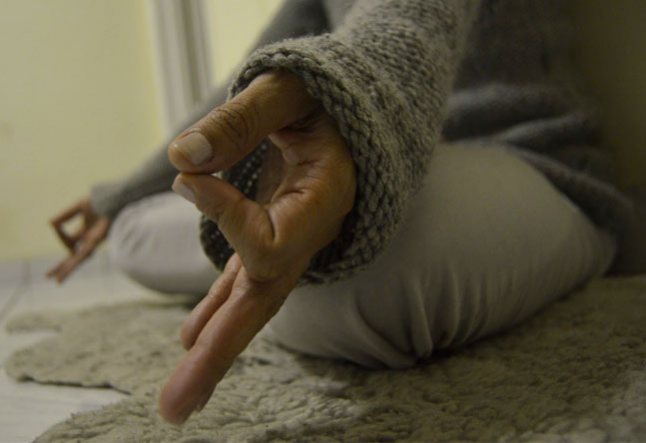 In his clinical experience, Dr. Khalsa has observed that “stroke patients with both sensory and expressive aphasia (patial or total loss of the ability to articulate ideas in any form) who practice the Kirtan Kriya exhibit improved mental function.” It’s also worth noting that several studies have found decreased bloodflow (hypoperfusion) in the posterior cingulate gyrus of the brain, he area responsible for spatial spatial memory and locational orientation, to be a first indicator of Alzheimer’s disease. The SPECT scans vividly illustrate that the Kirtan Kriya literally lights up this area of the brain with energy, blood and oxygen.